Edaran Tan Chong Malaysia (ETCM) has launched a new Nissan Serena 2018 model that comes with two variants, Serena S-Hybrid Highway Star and Serena S-Hybrid Premium Highway Star. Both models have the same engine and safety features. The difference is only the two-tone colors, Leather seat and some additional accessory available on premium models. This 7-Seater large MPV powered by 1,997 CC engine with XTRONIC CVT transmission. It produces 147 Hp of power at 6,000 RPM and 200 Nm of torque at 4,400 RPM. Both model available with 6 SRS Airbag, ABS with EBD, BA and Premium 6.75 Inch Clarion Advanced Display Audio. Nissan Serena S-Hybrid (2018) price in Malaysia star from RM131,800 for the base model. For the premium model with two-tone color priced from RM143,800. 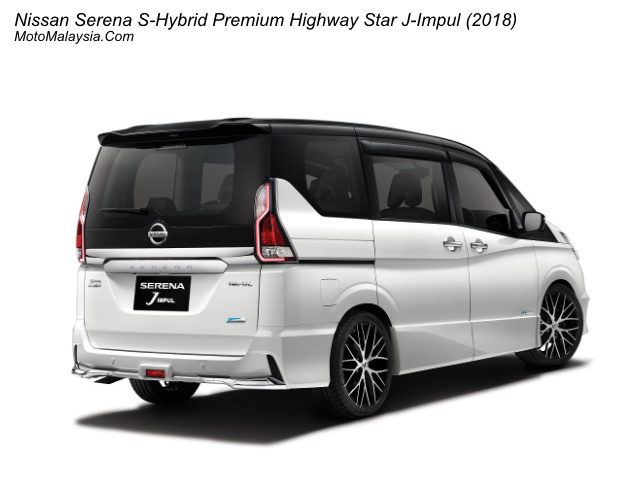 Nissan also released the new J-IMPUL Nissan Serena S-Hybrid Premium Highway Star priced from RM147,800 that comes with J-IMPUL body kit, 18″ Alloy Wheel, and Diamond Quilted Mocha Lether Seat.